Looking at Ansel Adams: The Photographs and the Man is an innovative app providing an insightful look at the man behind some of the most beloved photographs made in the twentieth century, including Moonrise, Hernandez, Clearing Winter Storm, and Moon and Half Dome. A must have for any Ansel fan, the app brings you closer to the photographer than ever before, with exclusive content, narration by leading Adams expert Andrea Stillman, and interactive features exploring Ansel's process and vision. Created in close collaboration with The Ansel Adams Trust and Ansel's expert colleagues, the App will enable you to see the American wilderness through "Anselian" eyes. • Slideshow of iconic images by Adams, with exclusive audio commentary by author Andrea Stillman. • Letters and postcards between Adams and colleagues in the art world, including Edward Weston, Alfred Stieglitz, and Garry Trudeau. 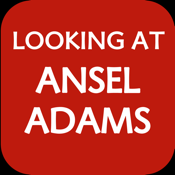 An interactive companion to the book "Looking at Ansel Adams: The Photographs and the Man" by Andrea Stillman, the app both complements the book and stands on its own as a rich compendium exploring Ansel's life and work. Free to download, the app includes material augmenting three of the book's chapters; complete the app by purchasing the additional seventeen chapters' material from within the app itself. Ansel Adams (1902–1984) is the most honored American photographer. Through the exhibition and publication of his work, his writing, and his leadership in the Sierra Club, Adams was also a prescient and highly effective voice in the fight to preserve the America wilderness. Andrea Stillman is the leading expert on Ansel Adams and worked closely with Adams for seven years in the 1970s as his executive assistant, after being on staff at The Metropolitan Museum of Art. She has edited a number Ansel Adams books, including Ansel Adams Letters and Images 1916-1984, Ansel Adams: 400 Photographs and Ansel Adams in Color.